It is difficult to find a symbol that is able to represent Greek culture better than its temples. 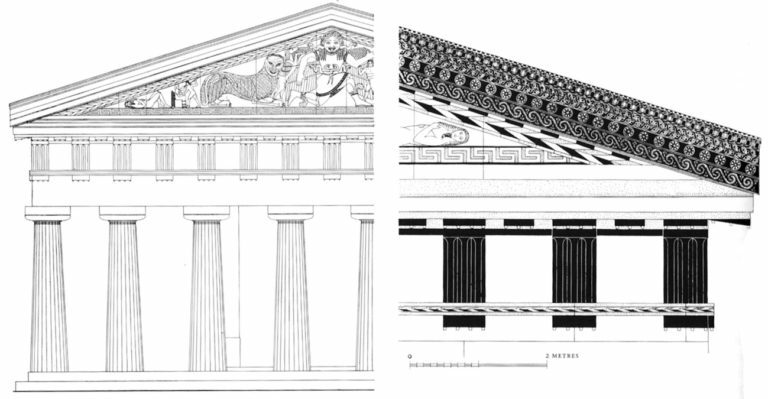 In addition, the Greek temple is exemplary for the simplicity of its architectural form – think, by comparison, about the complexity of an ancient Indian temple – and for the vast range of meanings of which its shape carries. Nonetheless, while a lot has been said and written about regarding architectural form, perhaps there is a lot less research concerning the content of the ideas that are at its origin. Perhaps I should rather say, the expression ‘content of ideas’ might not be too suitable, because it seems to be alluding to philosophical abstractions: we should be rather talking about the ‘life experiences’ of the Greek man that are adding on to and gathering together the constructive structure of the temple. With reference to what is relevant. First of all, a phenomenological point of view does not imply a documentary history, it does not need to connect concepts and notions in a chain of causalities, but it may make possible to draw on guidelines internal to the concepts and focused on the evolution of meaning, and therefore on the creation of relationships, rather than merely listing factual data. But as much as being relevant, it is also unusual the way in which this recollection is achieved. 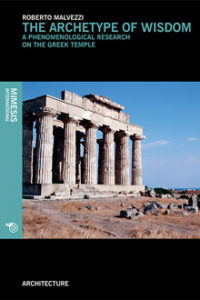 In fact, the theoretical-methodological problem of the ‘suspension of judgment’ (epoché) is suggested not so much by the point of view of the philosopher who does the analysis, but as a starting point for a ‘phenomenological history’ of those experiences that lead to the archetype that is at the origin of the architectural structure. The phenomenological theme thus takes on a significant and original shift: the analyst puts himself in the position of being the ‘constituent subjectivity’, and performs with himself the ‘putting into brackets’ naive knowledge which, by setting aside what is customary, allows access to the experience of the sacred. Moreover, in accordance with the very peculiar manner of the Greek culture. Such an experience, according to Roberto Malvezzi, is closely related to two fundamental issues: that of knowledge of the world, and in general of knowledge, and that of the hope of an approach between the divine and the human – we could say of a twofold transcendence of the divine towards the human and of the human towards the divine. This undoubtedly seductive interpretative idea prepares and justifies the development of that ‘phenomenological history’ of which we talked about, a development that is conveyed in the first part of this work. Of that ‘history’ we are given a trace from primeval archaism, which reaches the thresholds of the classical age and that, despite its brevity, can happily achieve its purpose. At the basis of this ideal history there is a conflict between the near and the far, between order and disorder, between cosmos and chaos, and of course all this calls into question the distance between the human and the divine. This query implies an impact on the emotional sphere, creating insecurity and with insecurity, anxiety and angst. The human and the divine are torn; in the divine there is power, in the human realm there is the ephemeral that can always be crushed. But this is just the beginning of the ideal: according to the author there is a path that leads, step by step, to overcoming this distance through the fields of the artistic elaboration to the climax of the temple. This culminating point cannot be considered only from the point of view of its beauty, or rather: in this beauty we must know how to grasp all those ideas of order, rest, harmony that characterize a relationship reconciled with the divine that is induced by its humanization. It will certainly not be unclear to the reader that a complex, but nonetheless, very close subject matter is encountered and shrewdly captured in this path, and I want to point out here at least the relationship with the natural element, the theme of how knowledge of an initially hostile world can give rise to hope for that once felt hostility to be overcome. On this background, the whole discussion about the architectural structure of the temple, which is thoroughly examined in the second part of the text, is particularly significant. In accordance with the author’s theoretical-philosophical choice, this structure cannot be considered a mass of well-arranged stones, but it must be perceived in the same manner as the senses of which it is the materialization of. In this discussion, the architectural details that seemed previously to be completely absent, almost entirely off-topic, now take on the utmost evidence, and the commentary devoted to them gives a vivid structure to the directorial idea of an ‘archetype’ underlying the architectural form. All this is made possible by the fruitful interaction between architectural competence and philosophical reflection, whose connection is the undoubted originality of this book. Giovanni Piana is an Italian philosopher. He taught theoretical philosophy at the University of Milan from 1970 to 1999. Later, he went to live at Pietrabianca di Sangineto (Calabria), from which he continues to write and publish. His philosophical position is characterised by the concept of phenomenology (“phenomenological structuralism”) influenced by Husserl, Wittgenstein, and Bachelard. His thought is oriented towards the philosophy of knowledge, the philosophy of music, and the fields of perception and imagination. He was a disciple of Enzo Paci and wrote his dissertation on Husserl’s unpublished works. His recent publications include Frammenti epistemologici, Lulu.com, 2015 and Album per la teoria greca della musica, 2010.